The following resources include journal articles and foundation reports on sustainability. 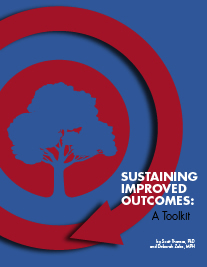 We have included resources on improved outcomes as well as on programs and organizations. We included resources on programs and organizations because there is limited research on and resources available for sustaining improved outcomes and because all three types of sustainability overlap. Note: When our work in sustainability began, the Sustainability: Model and Guide. NHS Institute for Innovation and Improvement was available publicly. This is no longer the case. Access to the guide is restricted to those working in the United Kingdom. While the information provided in that guide is helpful, we believe most of the concepts and factors can be obtained through the other resources provided. We have included the Sustainability: Model and Guide in the resources with the hope that it will become available again in the future. Schrier, M. “Is sustainability possible? A review and commentary on empirical studies of program sustainability.” American Journal of Evaluation, (2005) 26, 320-357. Johnson, K., Hays, C., Center, H., & Daley, C., “Building capacity and sustainable prevention innovations: a sustainability planning model.” Evaluation and Program Planning (2004) 27, 135-149. Mancini, J. & Marek, L. “Sustaining community-based programs for families: conceptualization and measurement.” Family Relations (2004) 53, 339-347. O’Loughlin, J., et al. “Correlates of the sustainability of community based heart health promotion interventions.” Preventive Medicine (1998) 27, 702-712. Pluye, P., et al. “Making public health programs last: conceptualizing sustainability.” Evaluation and Program Planning (2004) 27, 121-133. Pluye, P., Potvin, L., Denis, J., Pelletier, J., & Mannoni, C. “Program sustainability begins with the first events.” Evaluation and Program Planning (2005) 28, 127-137. “Risk for Program Sustainability Failure Assessment.” Missouri Foundation for Health. Schrier, M. “Is sustainability possible? A review and commentary on empirical studies of program sustainability.” American Journal of Evaluation (2005) 26, 320-357. Shediac-Rizkallah MC, Bone LR. “Planning for the sustainability of community-based health programs: conceptual frameworks and future directions for research, practice and policy.” Health Educ Res (1998) 13(1):87-108. Schrier, M. “Is sustainability possible? A review and commentary on empirical studies of program sustainability.” American Journal of Evaluation (2005):26, 320-357. “The Sustainability Formula.” TCC Group.